I was born and raised in Long Island, New York, in a music loving family. I was introduced to early R&B, Doo Wop and Motown at birth. My parents and uncles were not only avid listeners but collectors of vinyl. My dad was an entertainer as well. My love of music just kept growing along with me. By the age of seven, I knew every song by every artist as well as their background information. People used to bring me up on stage and try to stump me with Doo Wop trivia but to little avail. WBLI in Long Island would offer a free tee shirt to anyone that could trip me up. When only two tee shirts were awarded after a long period, I was officially dubbed as “Little Doo Wop.” It was indeed a proud moment for myself as well as my family. 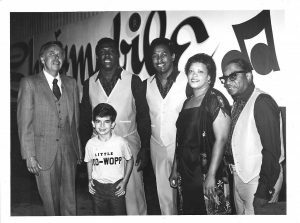 Here I am below at age five donning my “Little Doo Wop” tee shirt with Winnie Winfield and the Harptones. 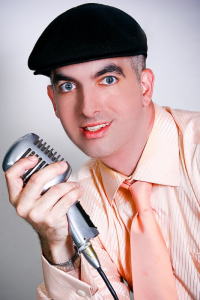 In addition to being a DJ for various events since 1995, I also sang bass for a group called “495 East,” aptly name for the interstate which runs through Long Island. I am currently a bass vocalist in my dad’s group, “The Exquisites,” in which my father is the baritone. I wouldn’t have it any other way! This great music will always be my passion and I am completely consumed by it. I cherish the music that I sing, collect and play and am very grateful to be able to share it all with you on Remember Then Radio.